When did Disneyland get so expensive? We had a rip-roaring good time at Disneyland and California Adventure on Monday. Perfect weather, reasonable lines, fantastic new Cars Land, and plenty of fun, fun, fun. Here is some of the damage done to our bank account. But it was worth it. We just won’t be going as often as we’d like. My chest. The pain, like there’s a giant mouse sitting on it. More math: Locker rental was . . . hmm, they don’t print it on the receipt . . . $7? Add 10.98 for two Mickey Mouse Pretzels for my wife and daughter (ketchup and mustard were free and all you could eat). Lunch for me: $15. Endless bottles of water during the day: I don’t remember, but I don’t think they were “out of the park” expensive. Even more math: Minnie Mouse headband for my daughter, $15. Dinner: $50. A “free” stuffed Bullseye my daughter won by rolling balls into holes faster than half-a-dozen strangers did only cost me $30 on the gaming card to win it. And at the end of the night, 50 more dollars for Goofy Gummies, cookies, gourmet marshmallows, and Mickey Mouse gingerbread mice for the ride home up the 5 freeway, which is the nastiest freeway to travel before and after going to the pleasant confines of the Magic Kingdom. I would appreciate it if Disney would buy all of the properties next to the 5 freeway and sprinkle some Imagineer Magic on them. So, taking into account that I lost some receipts, my grand total was over $550 for the day. 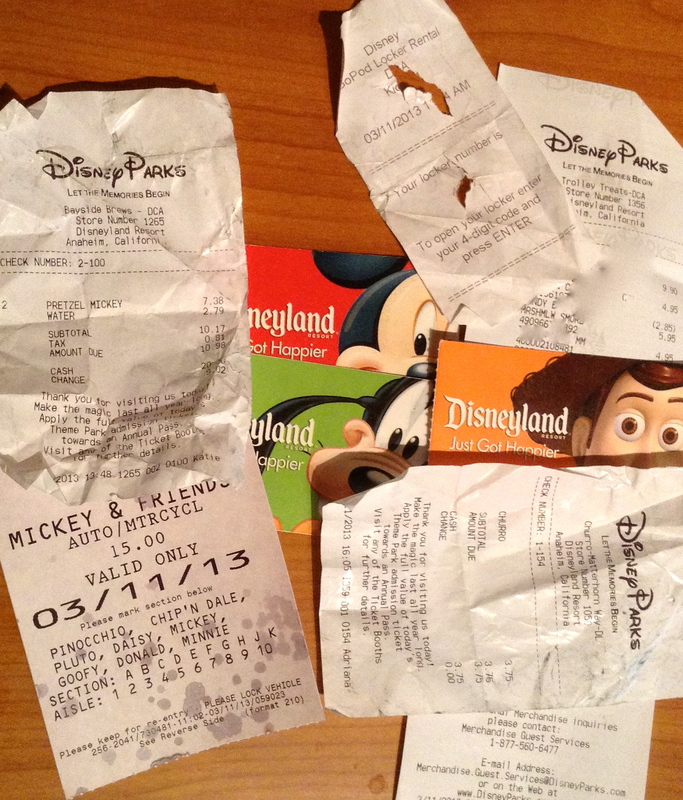 “Let the Memories Begin” is printed on the receipts. I get it. We have great memories of the day, but this is the first time I have memories of what we spent. I so miss Disney’s recession pricing. Bleeding from my lungs is a living creature or entity. I’m not sure what to call it. I just know it’s alive and looks for opportunities to take me down and make me pay for everything bad I’ve done in my life. It’s karma living inside of me waiting for payback. And payback is a real ball buster. We went to Disneyland yesterday. I didn’t quite feel 100%. Something was off both mentally – the panic attacks of earlier this week – and physically – a possible virus. So, the Disney adventure started with me battling myself and trying to avoid a full-on anxiety attack in the Magic Kingdom, with one of my primary concerns being bleeding from exertion. Luckily, the blood didn’t happen until I walked in the house last night. Lucky me, as I’d have hated it if it had happened in public on a ride. The blood isn’t filling the sink, as it has in the last five months, but it’s hard to tell which direction it will go. I started cipro right away. No more waiting a day to see if the doctor approves it – I awarded myself an honorary doctorate in medicine and green-lighted the antibiotic. Go for it. Today, the blood seems to be retreating slowly. I have a father/daughter dance tonight and my daughter’s birthday party is tomorrow. So, I’m hoping I can hold out and the cipro will work this time. Here’s crossing my fingers I don’t cough up blood during a dance tonight, which would be like a scene out of a Stephen King movie. 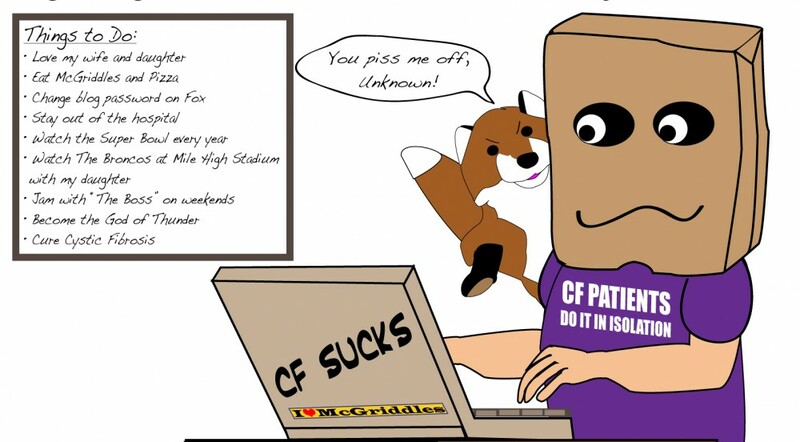 These are the days when I cannot express my sincere hated of cystic fibrosis with words. I lack the ability to describe the depth of my anger. And if any healthy dad comes up to me tonight crying about his life, I’ll probably have to punch him in the nose and ask him what his life would be like if he had to worry about bleeding all the time. Give someone like that CF for six months and then lets see how much they complain about what they have or don’t have in life. They’ll feel like they won a 100 million-dollar jackpot the day their six month sentence is up.